Excelling expectations, following success in the opening two rounds on Tuesday 7th November, Frenchman Joe Seyfried emerged the most surprise name to reach the quarter-final stage of the Under 21 Men’s Singles event at the Seamaster 2017 ITTF World Tour Platinum German Open in Magdeburg. He proved the nemesis of Hong Kong. The no.25 seed, in the opening round he had beaten Ng Pak Nam, the no.10 seed (11-7, 16-14, 11-5), one round later he accounted for Lam Siu Hang, the no.7 seed and the winner earlier in the year in Qatar. Impressively Joe Seyfried prevailed in four games (11-4, 9-11, 11-9, 11-4). Success for Joe Seyfried, one of four Frenchmen in the second round, he stands alone. He carries the flag for France, the Tricolour. Unfortunately, Alexandre Cassin, the no.11 seed, had to withdraw from proceedings injured, thus affording China’s Xue Fei, the no.3 seed, a walk-over; Can Akkuzu, the no.9 seed, was beaten by Japan’s Kazhuhiro Yoshimura, the no.6 seed, in a full distance five games contest 911-3, 8-11, 11-5, 10-12, 11-4). 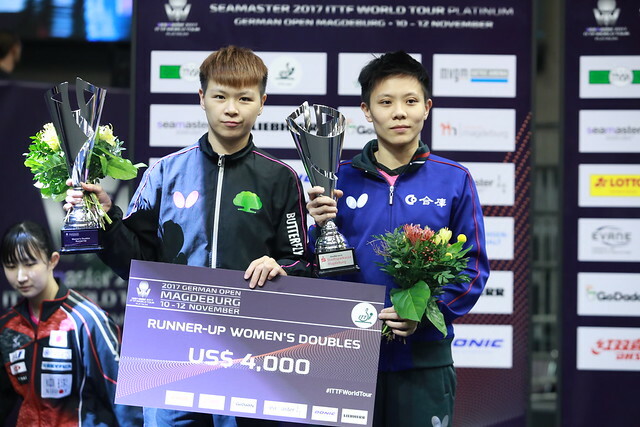 Wins as status expected, it was the same for Ho Kwan Kit, the top seed, who to some extent balanced the scales for Hong Kong. He beat Hungary’s Bence Majoros, the no.23 seed (11-6, 13-11, 11-7). A comfortable win for Ho Kwan Kit but not for Chinese Taipei’s Liao Cheng-Ting, the no.2 seed. He lost the first two games against Korea’s Park Jeonwoo, the no.15 seed, before recovering to win the next three (7-11, 8-11, 11-7, 12-10, 11-7). Imposing performances, it was the same from Mizuki Oikawa, the no.5 seed and like Yuto Kizukuri from Japan, as it was from the Czech Republic’s Tomas Polansky, the16 seed. Mizuki Oikawa beat Romania’s Cristian Pletea, the no.14 seed (11-5, 11-9, 9-11, 14-12). Tomas Polansky accounted for Austria’s Andreas Levenko, the no.26 seed (5-11, 11-3, 11-3, 11-7), the player who in the opening round had caused an upset of note by beating Japan’s Tonin Ryuzaki, the no.8 seed (11-7, 7-11, 12-10, 7-11, 13-11). In the round of the last eight, Ho Kwan Kit meets Kazuhiro Yoshimura, Joe Seyfried faces Xue Fei; in the adjacent half of the draw it is Yuto Kizukuri versus Mizuki Oikawa, Tomas Polansky in opposition to Lia Cheng-Ting. The quarter-final matches will be played on Wednesday 9th November.